Our company originated in 1998 from the most basic need of the baker-confectioner who are prompt and responsible technical support. The founder of our company EMM. VARDIAMPASIS realizing the needs of the space created by a company which aims to find everything on the side of the baker-confectioner, with the right solutions, continuous updating of technological developments and innovations around the monitor. Now housed in the private area of ​​800 sq.m. 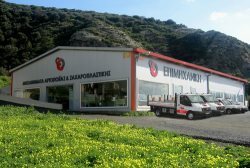 in Heraklion, Crete is the only company to provide immediate technical support across the island 24 hours a day by experienced and qualified technical personnel of all specialties. It has 2 fully equipped mobile workshops directly support specific unit direct replacement of the machine in case of serious injury and the most comprehensive site workshop and reconstructions 500 m, equipped with the latest technology. The area of ​​the warehouse is equipped with a full range of spares and consumables. Special design department takes care of all stainless steel construction and non-compliance with the requirements and needs of our client's site. The design and renovation of the stores is done through the rendering, which depicts the true picture of the future space. Spacious 300 sqm exhibition space, new and used equipment, where you can find and try the machine for you. The sales department and our imports are fully informed of all developments and is able to advise you and suggest the most appropriate solutions to your needs. We also work with experts in both food production process and design - layout of your premises, who advise and show you with suitable and compatible solutions.